There are many examples. As noted above, the key to stocking up is to make sure you’re buying items that you plan on using. If hamburger meat is on sale, but you don’t eat much red meat, then stocking up probably isn’t such a great idea. Buying stuff on sale and saving it for later is great, but at a certain point you have to use all of that stuff. Using up your stock is what I refer to as ‘stocking down’. This is important to do on a regular basis. Here are a few tips on when to stock down and how to do it. If you buy stuff and it goes bad before you use it, then you’ve missed the point completely. Whenever possible, we rotate our stocked items so that the oldest stuff is in the front and the newest stuff is in the back. I’ll also go through certain categories periodically and look at the expiration dates. If it looks like we’re coming up on needing to use stuff, we’ll start planning more diligently around those particular items. I watched a couple episodes of the show Extreme Couponing back when it first came out. I stopped watching because the people featured annoyed me to a degree that I couldn’t be bothered with anymore. 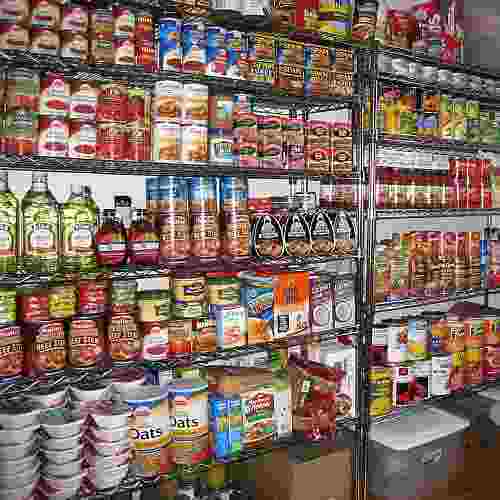 One of the things that killed me is that so many of the people had to build extra shelving and take up space in their homes to accommodate all of the stuff they were stocking up on. Most rational people aren’t going to do that, and will instead limit themselves to a pantry, some cupboards, and maybe some shelves in the basement. If you see that you’re starting to run out of space, then it’s time to stop stocking up an to start stocking down. We keep track of what we spend on groceries each month. Now that we have a history of that, I’d like to start looking at those numbers in greater detail. If there are particular months of the year where grocery bills seem higher, it could be a good idea to plan on reducing costs during those months by stocking down. Many times, you can plan on stocking up on items during certain parts of the year. Around the holidays is a great time to stock up on baking items. Summertime will always find you great deals on hot dogs. If you know you’ll use these items at other points in the year when the items typically aren’t on sale, stock up accordingly, and don’t forget to stock down during the off months! When you stock down, it’s pretty rare that you can completely eliminate having to buy groceries. Don’t go in with this approach. Instead, understand that your goal should be to use as many of the items as you could with the idea that you’ll reduce, not eliminate, your grocery bill. But, even if you can plan on getting 50% of your ingredients for your weekly meals from your stock, that will greatly help out your weekly grocery bill. Stocking up on items can be an important strategy to saving money, but working through and using up those items and doing so with a solid plan is also an important part of the money saving opportunities that are possible. 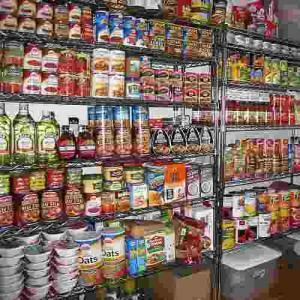 Readers, what do you do to make sure that you stock down on the items which you’ve stocked up on? Ashley Madison Hacked And Nothing To Worry About For Me! For us it’s less about drawing down the inventory as to be sure nothing is aging. The canned soup brand I like, for example, is a $2.49 regular price, but $1.00 on sale. When the sale is on, the new purchases go in back of the older cans. Similar process for pasta. The frozen meat gets a date on the freezer bag. TP and paper towels both just get bought on sale to fill a space we have in the closet. The sale price can be half the regular price, and worth stocking up. We follow many of the same practices. Nice to know we’re in good company! I always look at the expiration dates but too lazy to check it at home, maybe rotating the old ones in front is a really nice way. And of course the space, it’s not like we gonna have a catastrophe right? And how can we eat all of those in the photo? The other points are super great too. Thanks for the nice post and tips! [I always find stocking up posts to be honest]. I always have stock of cereals and canned goods and I have a list where I write down the expiration data of each item. Most of them have the same date so basically it’s easy to monitor. The interesting thing about “stocking up” on things when they’re on sale is that it never seems to cause us to spend less. We’ve purchased a half a pig, or a quarter cow before, and stocked up our freezer with meat. Since meat is one of the most expensive, and largest items on our grocery list one would think that would cause our grocery bill to go down each week – but it didn’t. We always seem to find something else to spend it on – the grocery budget is always completely consumed. I would bet if I really did the analysis, I’d find that we eat better (or more extravagant) when we do this sort of thing, but it never accomplishes the goal of saving money. Spending the money you save is something that’s very hard to avoid. I admit, we often fall into the same trap.